I have yet to catch The Doom Patrol, but I have to say I like the casting of Brendan Fraser as Robotman. I also like how comics-accurate his design is, but I have a question for those who have seen full episodes. To me it looks like there is almost no facial movement, except for the eyes which can blink. Does this work or do you find it jarring? Is the character able to effectively emote? Ross, Cliff's face doesn't move. It feels eerie and foreign -- which fits in with the theme of the show. Every member of the team struggles with their humanity while sequestered from 'normal' humans. The whole effect is like a funhouse mirror-reflection of super-heroes. There's humor and action and pathos, but it's distorted. Doom Patrol is well worth watching. I've only seen clips, but your impression is correct (as is Mike's answer): Cliff's face doesn't move, except for the occasional blinking eyes, leaving only voice and posture for expression. The latter is actually done by Riley Shanahan, who is much larger then Brendan (6'5", I think) and so fits the model better, though Brendan still plays Cliff in flashbacks (and as psychic projections). The two work well together, and it's hard to tell which performance is done first. For today's cover, I think you did an outstanding job here in setting up an exciting story. From the Patreon email I got, I was expecting Johnny Storm rather than Jim Hammond, though of course Jim's the only possible choice for this tale. Nice cover. I have yet to see the series as well. It looks interesting but I find it strange that Cyborg has, once again, been shoehorned into another team. Couldn't tell you, Ross; pro or con. I don't stream the on-line stuff due to the fact I don't _own_ a pc! I just lease...with no option to buy. Do you find C-3PO jarring? Cause thats what I akin it to. I could see the Thinker joining up with the Mad Thinker to steal a statute by Rodin. Ah, yes! I can just see Quasimodo at the main entrance to the South Bend, Indiana, campus. "Be our guest! Be our guest! Did you ace your entrance test?" And before anybody gets overly serious; yes! I know that Anonymous 708 was talking about the classic French cathedral in Paris. Truly, a tragedy, re: all that historical significance! As far as today's cover-sim is concerned, I have just one question. 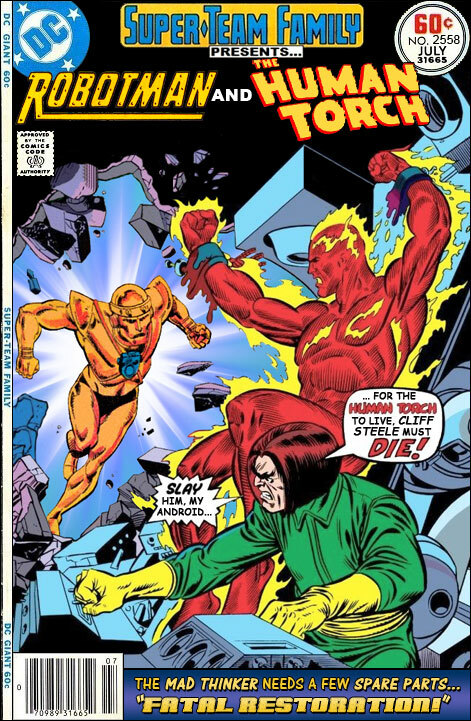 Is that the Golden Age Human Torch aka "Jim Hammond," about to create molten Steele? @Carycomic: yeah, I think so. @Cary: I rather imagine Quasimodo playing football for the University -- halfback, of course. Tigra and Wildcat in: "From Champ to Chaperone!"